YouTube is amazing. In just a few short minutes, you can learn how to do anything. Like how to create your own stand-out YouTube thumbnails in Canva! Even better, you don’t need to have (or be) a YouTube Manager or a Graphic Designer to have a pro-looking channel. You’ll be happy to hear that Canva has already made it super easy for your channel to stand out and improve your click-through rate. In today’s short training I’ll share how to create your very own YouTube thumbnails, so you can create your own unique style for every video and easily transform the overall look and feel of your channel. But before we dive into the how, let’s cover why creating your own thumbnail is so important. According to this awesome Canva post, 5 billion YouTube videos are watched every day. Your thumbnail is your visual connection to potential viewers, and it’s what’s going to help your ideal client decide whether or not your video is enticing enough for them to click through and take action. Creating your own thumbnails is an easy way to stand out and have your ideal client subscribe, binge-watch and come back for more awesome tips. If your headline helps you show up, then your thumbnail is what gets your ideal client to click on your video and take action. Ready to learn how to create your own YouTube thumbnails? You have full control over the first impression that your video makes, so don’t let YouTube pick a random image for your thumbnail. Your thumbnails should be easy to read, on brand and easy to create every time, but it should also be simple for your ideal client to see and understand what your video is about. Keep your thumbnail design simple. Pro tip: Go through and see what others are doing. Here are a few examples of channels that I think are doing a great job at their thumbnails — Bloguettes; Trips with Trena, Love Inspired, Alex Beadon, Jess Creatives, Jessica Rasdall, Studio DIY and, of course, keep your eyes on the TCCtv channel. See how these YouTube channels have an individual personality, and are all perfectly on brand? 1. With a new video — click the upload icon (third from the right), then upload your thumbnail. 2. With an existing video - simply click on the video and select “Info and Settings” or the “Pencil / Edit” icons. There’s no need to create something from scratch. Talented designers have already done the hard work for you babe! They know what makes for a great YouTube design, now all you need to do is customize it and make it yours. Simple, go to > more designs (see the + plus sign) and select the YouTube Thumbnail design under Social Media and Email Headers. Pro tips: If you prefer creating your thumbnail from scratch, use a these dimensions: 1280 x 720px. Make sure to name your design so it’s always easy to find and search. Add an image — Choose an image that’s relevant to your training, or that will intrigue your ideal client. Add your text — Make sure your text is large enough so that it’s still easily readable when your image is reduced to thumbnail size in the search engines or on Facebook. Try to emphasise one major benefit of your video in your thumbnail. Add your branding elements — Change out the colors to match your branding. Add your logo or URL if it makes sense and see how you can personalize your YouTube thumbnail template without taking away from the main benefit and video topic. Pro tip: Make sure your thumbnail and Youtube banner complement each other and use a relevant profile image so we can instantly recognize you. Now that you know how to create your own thumbnail, give your whole channel a make-over and add custom thumbnails to all your old videos. Pro tips: I recommend using the same style but changing things up for different types of videos, playlists or challenges like I mention in the video. That’s it! That’s one easy way to make sure you stand out on YouTube and create a consistent visual experience for your ideal clients. We can’t wait to see your new eye-catching thumbnails and channels! Tell us in comments below who we absolutely must follow on YouTube. Who's getting it right? Get creating in Canva. We’d love to see your fab new Thumbnails. Looking for more Canva template solutions. You can learn more about my designed-to-match Canva templates here. Follow the #TCCTribe on Instagram! One of the things I hear a lot as a Canva Designer is that people feel stuck on ideas for their graphics, and want to know how to create great looking graphics faster. Well, the last thing I want you to do is reinvent the wheel every single time you sit down to create your graphics. So, if you’re feeling creatively stuck with your visuals, then today’s training is perfect for you. I want to show you how to approach one visual and use that “style” to batch the rest of your graphics so you can save time and feel great about your visuals. How to create a consistent look and feel with your visuals. I start off by creating one image for my blog post, and let that image inspire the rest of the images needed to promote my post. Whether you’re starting from scratch or working from a preset template, remember to add visual cues and concepts that your readers are accustomed to seeing on your online spaces. In the video, you can see how I mimic the basic layout of my Recipe Book Training to create a custom Pinterest image that “matches”. You can use Canva for Work’s Magic Resize feature to create duplicate images in different sizes (see first image below), or you can “drag” your new design into your preset template and adjust the design accordingly. Simply got to, Layouts > All your designs > and find the Pinterest post image you just created. Drag it into your new design and adjust (see second image below). Both options are a great way to save time. I usually go with option two, as I want to make sure all my graphics look consistent with the my existing images for that platform. You’ll see me follow the same steps as I do with the previous image, making it easier to create a consistent look for all of my graphics. And, because I’m creating them all in one work session, I can easily see how they’ll “fit” together, and which images need to be adapted slightly so that they don’t all look the same. You can easily do this by swapping out your background image for a plain color or changing out the main color for an accent color. Your Instagram image is going to depend on your visual strategy for Instagram. You could do lifestyle shots with images for tips and videos in between (like I do here), or you could use the same image for Instagram as you use on your blog post (like Think Creative Collective does). Do what works for you (and your brand) and do what is easy to stick with. A mock up image is an easy and versatile image to promote your post on Instagram, Twitter, Facebook or Pinterest. 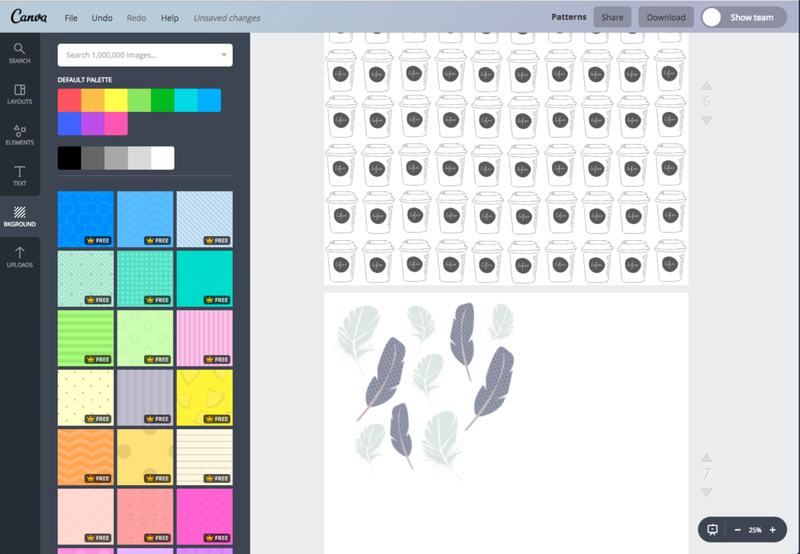 See How to use Canva to create your Product Mockups to make your own profesh looking mock ups. And there you have it, babe. Five image ideas to promote your next blog post in just a few short minutes. As I mention in the training, it helps when you create your images around a central theme. It will also save you heaps of time and frustration if you create them all at once. If you’d like to feel super fancy and have your very own personalized Canva templates to play with, visit NicholetteStyles.com and poke around in the options available. You can also send me a note here. Instagram is our favorite place to meet you!